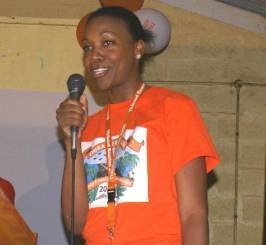 Roseau, Dominica – January 13, 2009………………On the invitation of organisers of the 2008 Thibaud Reunion, the Prime Minister, Hon. 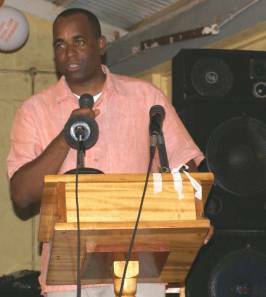 Roosevelt Skerrit addressed a Town Hall Meeting in the village of Thibaud in late December where he outlined the tremendous strides that have been made by his Government over the last several years, especially with respect to education and road infrastructure in the Vieille Case constituency. According, Hon. Skerrit, who is also Parliamentary Representative for the area significant strides have been made in education, where many young persons from that part of the country are being granted opportunities to empower themselves irrespective of political or religious affiliation or socio-economic circumstances. Reference was made to the fact that there are countries in the world far richer than Dominica where children will not see a primary school let alone a secondary school. The Prime Minister added that his Government achieved Universal Secondary Education (USE) two years earlier than planned (2005) so that every child who gets to grade six is guaranteed a place at a secondary school. The Prime Minister also spoke of the completion of the road from the Blenheim Junction to the new Thibaud Bridge at a cost of $3 million and the signing of a contract recently for $1.7 million to build the section from Gommier to Au Park to be followed by the section from Au Park to Auto at a cost of $2.9 million. Hon. Skerrit also announced that the Thibaud Primary School would be demolished to make way for the construction of a smaller school funded by the Government of the Bolivarian Republic of Venezuela under the ALBA arrangement. The Dominican leader also announced that water would soon be brought to the people in the hamlet of Morne Savon with funding coming from the Government of Dominica and the Caribbean Development Bank through BNTF. Strong emphasis will be placed on housing and the installation of washroom facilities in the village of Thibaud in 2009, Hon. Skerrit stated. During the discussion segment of the Town Hall Meeting several villagers expressed their satisfaction with the performance of the Government and the Prime Minister in particular. Also in attendance at the Town Hall Meeting were Minister for Tourism, Hon. Ian Douglas, Minister for Health and Environment, Hon. John Fabien, Minister for Housing, Lands and Telecommunications, Hon. Reginald Austrie, Minister for Education, Hon. Sonia Williams Minister for Economic Development and Urban Renewal, Hon. Julius Timothy, Minister for Public Works and Infrastructural Development, Hon. Rayburn Blackmoore and Senator Gloria Shillingford.